For the first time Russian Navy Commander publicly explained why we need the French heli-carrier. Last Friday, on June 17, the head of Rosoboronexport Anatoly Isaikin and director of French shipbuilding corporation DCNS Patrick Boissier finally signed the contract on two Mistral class assault landing ships for Russian Navy. In contrast to earlier information, the agreement was signed not in Paris during the visit of Russian premier Putin but at the Saint Petersburg International Economical Forum in the presence of president Medvedev who had been supervising this sale throughout the recent two years. The contract cost was declared as EUR 1.2 bln. The ships will be constructed by DCNS shipyards in Saint-Nazaire; up to 40% of equipment will be delivered from Russia. If an appropriate decision is made, other two analogous ships can be built in Russia under French license and technology. This option is also provided by the agreement signed in St. Petersburg. By the way, Russian Navy will receive the ships along with all control systems, including the notorious SENIT-9 tactical information system which has been in the center of "battles" between Russian and foreign politicians, experts, and mass media. For one, US congresswoman Ileana Ros-Lehtinen said right after signing of the Mistral contract that "it is deeply troubling that France, a NATO ally, has decided to ignore the clear danger of selling advanced warships to Russia even as Moscow is taking an increasingly hostile approach toward the U.S., its neighbors, and Europe itself". "Arming our opponents to get a cash benefit or a mirage for cooperation, which will never become a reality, is a huge mistake", said she in the statement. Not all Russian experts support this contract either, and that was widely indicated in press. As for our experts, the French helicopter carrier is primarily designed for expeditionary operations, i.e. landing operations on enemy coast. However, Russian military doctrine does not assign such tasks to the Navy – it is supposed to defend national coastline, Russian sea economic zones, and freedom of navigation at international sea lanes. 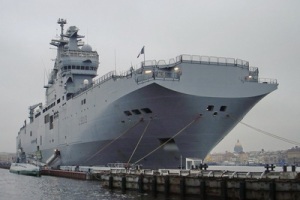 By the way, Russian Navy Commander-in-Chief Admiral Vladimir Vysotsky made it clear publicly why we need Mistral. "Mistral is designed and build as power projection and command ship", report information agencies citing the admiral. "This ship should not be considered separately as helicopter carrier, landing craft, command ship, or floating hospital. Well-equipped command center on board those ships makes possible to control any force at any distance from naval bases". As for Vysotsky, construction technology of such ships enables integration of Russian weapon systems, including amphibious craft and deck-based aviation. Sure, we should have asked the Navy Commander to specify on what countries our navy wants to "project force". Judging by plans to station first two Mistrals at Pacific Fleet for protection of Kuril Islands – does anyone plan to seize them though? – an object of such projection can be either Japan (America's ally), China (our strategic partner), or North/South Korea. Again, Seoul is not suitable. It is also the Washington's ally. And it seems pointless to project force on Pyongyang, as even Americans do not take a risk of doing that. Russian deck-based aviation for Mistral is also an obscure issue. Dimensionally, our attack helicopters like Mi-24, Mi-28N, Ka-52, and shipborne ones Ka-27, Ka-28, Ka-31 are larger (higher) than French analogs; so, one should refit the ship's helicopter hangar for them. This will definitely imply additional costs, same as replacement of Mistral's pretty weak arms including antiaircraft weapons. There are some other fund-requiring problems, such as construction of coastal base for Mistrals at the Far East. Otherwise, leaving of such big hulls buoyed in Peter the Great Bay or in other eastern harbors like it was with our Project 1123 helicopter carriers Moskva and Leningrad would only mean needless wasting of their service lives. In brief, the French assault landing ships which are to join Russian Navy in 2014 and 2015 can become not reinforcement for our surface ship groups – which are also to be shaped, by the way – but a headache for Russian admirals. Obviously, purchase of Mistrals being so pushed-through and promised to Sarkozy by Medvedev is nothing more but a kind of an appreciation to the French president for his support during the South Ossetia War in August 2008. And 1.2 billions euros is a good price for that. Moreover, Sarkozy just like Medvedev is seeking to be re-elected next year. And thousand of new job positions in Saint-Nazaire plus long-term contracts with Russia entailing after-sale services and spare part deliveries look like a very good political backup to outrace opponents. If this is the case, all talks whether or not we need Mistrals are nothing but mere details.